The International Atomic Energy Agency finds that Iran made concerted attempts between 1998 and 2003 to develop a nuclear bomb. 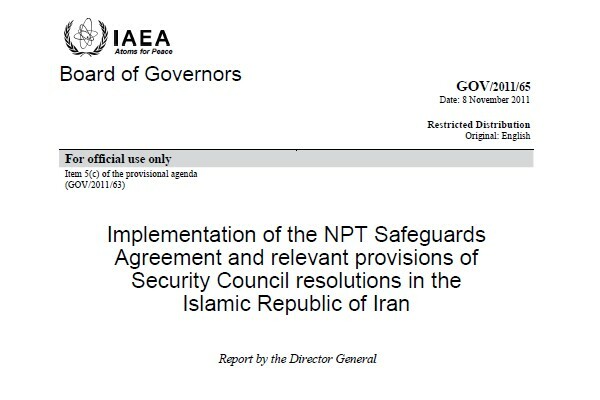 The IAEA report provides new detail about Iran's secret nuclear weapons program. Iran has built at least two facilities for fuel enrichment, which since 2005 have both been generating 20% enriched uranium, in defiance of UN Security Council demands for suspension. If the current stockpile was further enriched, it would be enough for two weapons within about two years, according an IISS analysis. The IAEA found evidence that Iran was developing components for nuclear weapons. These include sophisticated detonators and "multipoint initiation systems" for uniform compression of the nuclear material. The dimensions of the hemispheres and detonators that Iran tested exactly matched those of the payload chamber of its Shahab 3 missile system. Researchers performed many tests to ensure that a bomb could survive blast-off and flight. Iran was using tungsten as a simulated nuclear explosive. Tungsten can be heated and compressed just like nuclear fuel to form a molten fluid. A large and undeclared cylindrical vessel was found where up to 70 kg of high explosives could be safely detonated and contained in experiments to model compression and detonation. Iran has been using sophisticated computer programs to simulate and model shock waves in metal, neutron flows, and the effects of shock compression. That's just the sort of data needed to design and build a warhead. All this research on so many devices essential for nuclear weapons leads the agency to express "concerns about possible military dimensions to Iran's nuclear program". The latest IAEA report shows how Iran established a comprehensive program to develop all the key technologies for an implosion-type nuclear weapon for its ballistic missiles. Most of the reported weapons development work took place between about 1998 and 2003, although some activity may be continuing today. In late 2003 Iran suspended weapons development on fears of a U.S. attack after exposure of its secret enrichment activities. Western governments believe that Iran cannot make a dash to produce nuclear weapons without the IAEA knowing in time. The IISS concludes that Iran would need about two years to produce a nuclear weapon, but it would make no sense for Iran to risk massive retaliation to do so. The report says Iran received foreign help for weaponization. A former Soviet expert spent six years in Iran lecturing on the topic. Iran also received bomb designs from the A.Q. Khan network and sought foreign training on computer modeling of nuclear chain reactions from "an institute in a nuclear-weapon state". Powerful figures in Iran realize that the Islamic Republic needs to act. If Iran can be persuaded to resume talks, this might reduce pressure in Israel for military action.